St Clare supporter Joe has gone above and beyond for St Clare! A Grandson from Epping successfully completed a skydive challenge on Saturday 5th January 2019, in memory of his grandmother and in aid of St Clare Hospice. Joseph Loder, (21 years old, from Epping) took on a skydive challenge at Hinton Skydiving Centre in Hinton to raise vital funding for St Clare Hospice after we cared for his grandmother, Angela Chandler, during October 2017. Angela, a resident of Loughton, sadly died in November 2017 in the care of St Clare. After collecting sponsorship money from his skydiving challenge, Joe has raised more than £1,200 in vital funding for St Clare – after originally setting his fundraising goal at just £100! 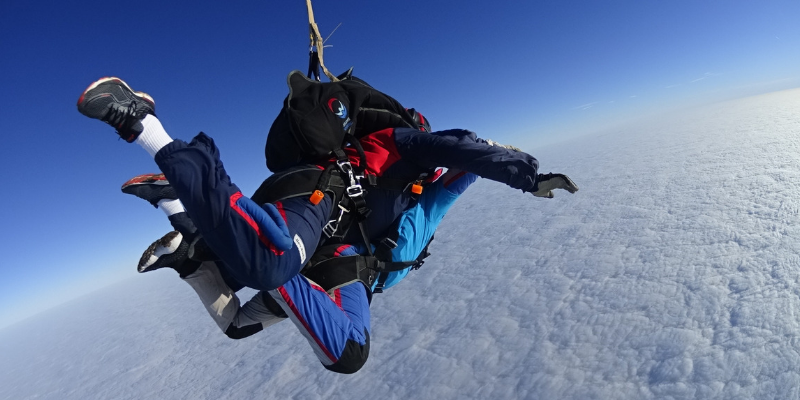 Having smashed his target, Joe bravely took the plunge out of an aircraft at 13,000ft for his beloved Nan and St Clare.